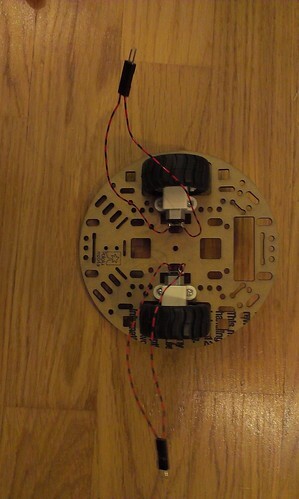 Assembling the robot was relatively easy, since I used ready-made shields. Only things you need to solder, are wires from the motors to the motor shield. And after that Arduino, XBee shield, and the motor shield in that order. I used XBee Series 2 devices, and the setup is documented quite nicely in Arduino guides. In my setup XBee A is coordinator and transmits data to XBee B, which is a router, and XBee B sends data to XBee A. Both XBees use AT mode, since that is easier to work with than API mode. The code was surprisingly simple, because, as mentioned, I used XBees in AT mode and by default XBee is wired to the (first/only) UART port of Arduino. Using the existing motor shield code as a base, I needed to add only initialization for the second motor, functions to handle forward, backward, and turning, and commands received via XBee. 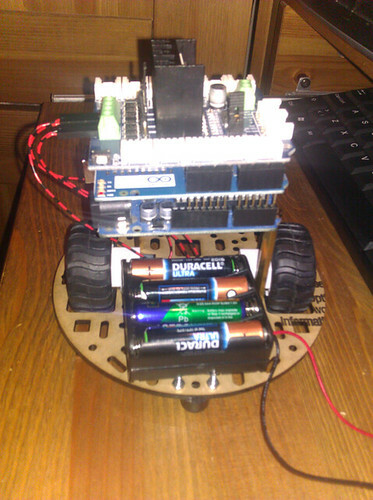 The rest of the code can be found from arduino-rc-robot repository. Finally, I connected XBee Explorer USB to my PC, opened a terminal program, and started sending control commands.